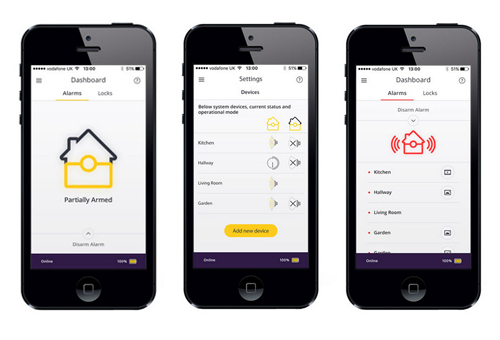 Yale wireless smartphone alarm system, with SmartPhone app control and alerts when the alarm is triggered. The Yale HSA-6610 Smart App Alarm Kit is designed to give you ultimate control of your home security. The intuitive wireless system has been designed with DIY in mind ensuring no wiring or running cables in walls or under the carpet and you won't need the services of a qualified electrician. The alarm components are pre-linked making installation easy to complete on a DIY basis and have a 30 metre wireless range (in open field conditions) using a 433MHz frequency, ensuring you can place them practically anywhere. The system is operated via a smartphone app and can also be armed and disarmed with the keypad. When the alarm is triggered, a loud 104dB external siren will sound to alert others of an intruder and the system will also alert you via app notification, SMS or email. The HSA-6610 includes five components but can connect up to 20 accessories including additional PIR and door sensors, allowing you to customise your alarm system to suit your property and lifestyle. The Smart Hub is the heart of the alarm system and is connected by an Ethernet cable (included) to your broadband router. Once connected to your router the hub connects up to 20 components via wi-fi to each device on your alarm system. All the wireless components are linked together straight out of the box. There is no technical knowledge or wiring required to install a Yale HSA Smart Alarm. You can access all of the alarm settings and features via the Yale Alarm App (available for iOS and Android). The system can be activated and deactivated using your SmartPhone. * Requirements: This alarm system requires a broadband internet connection with a router that includes one free wired network port. SmartPhone must be iOS 9.0 and above (iPhone 6 or above) or Android 4.2 and above.